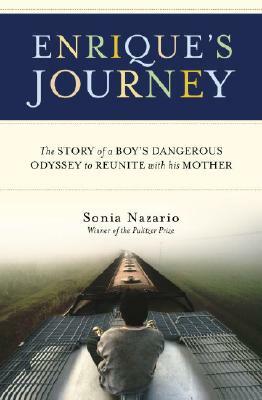 In this astonishing true story, award-winning journalist Sonia Nazario recounts the unforgettable odyssey of a Honduran boy who braves unimaginable hardship and peril to reach his mother in the United States. When Enrique is five years old, his mother, Lourdes, too poor to feed her children, leaves Honduras to work in the United States. The move allows her to send money back home to Enrique so he can eat better and go to school past the third grade. Lourdes promises Enrique she will return quickly. But she struggles in America. Years pass. He begs for his mother to come back. Without her, he becomes lonely and troubled. When she calls, Lourdes tells him to be patient. Enrique despairs of ever seeing her again. After eleven years apart, he decides he will go find her. Enrique sets off alone from Tegucigalpa, with little more than a slip of paper bearing his mother’s North Carolina telephone number. Without money, he will make the dangerous and illegal trek up the length of Mexico the only way he can–clinging to the sides and tops of freight trains. With gritty determination and a deep longing to be by his mother’s side, Enrique travels through hostile, unknown worlds. Each step of the way through Mexico, he and other migrants, many of them children, are hunted like animals. Gangsters control the tops of the trains. Bandits rob and kill migrants up and down the tracks. Corrupt cops all along the route are out to fleece and deport them. To evade Mexican police and immigration authorities, they must jump onto and off the moving boxcars they call El Tren de la Muerte—The Train of Death. Enrique pushes forward using his wit, courage, and hope–and the kindness of strangers. It is an epic journey, one thousands of immigrant children make each year to find their mothers in the United States. Based on the Los Angeles Times newspaper series that won two Pulitzer Prizes, one for feature writing and another for feature photography, Enrique’s Journey is the timeless story of families torn apart, the yearning to be together again, and a boy who will risk his life to find the mother he loves. Sonia Nazario, a projects reporter for the Los Angeles Times, has spent more than two decades reporting and writing about social issues, earning her dozens of national awards. The newspaper series upon which this book is based won the Pulitzer Prize for feature writing, the George Polk Award for International Reporting, and the Grand Prize of the Robert F. Kennedy Journalism Awards. Nazario grew up in Kansas and Argentina. She is a graduate of Williams College and has a master's degree in Latin American studies from the University of California, Berkeley. She lives in Los Angeles with her husband. For more information, visit www.enriquesjourney.com.